Horses! They seem to be everywhere and yet forgotten in some Civil War studies. Just for fun, we thought it would be nice to spend a whole month of Fridays talking about some horses of the Civil War era that belonged to famous generals. Of courses, horses had many tasks during the conflict – pulling artillery, supply wagons, ambulances, cavalry mounts, officers’ steeds. Horses are immortalized in the statues that grace battlefields, memorial parks, and cities. And – still we focus more on the man than the beast. That’s natural – after all, the generals fight the battles; the horse just carries them so they can see the battlefield and plan the strategy. But it’s time for some of those horses to get some extra attention and love! Starting January’s historical theme of the month is General Robert E. Lee’s most famouse horse: Traveller. Nope, I didn’t misspell the name. General Lee preferred to write his horse’s name as “Traveller” with two LL’s. Where did Traveller come from? 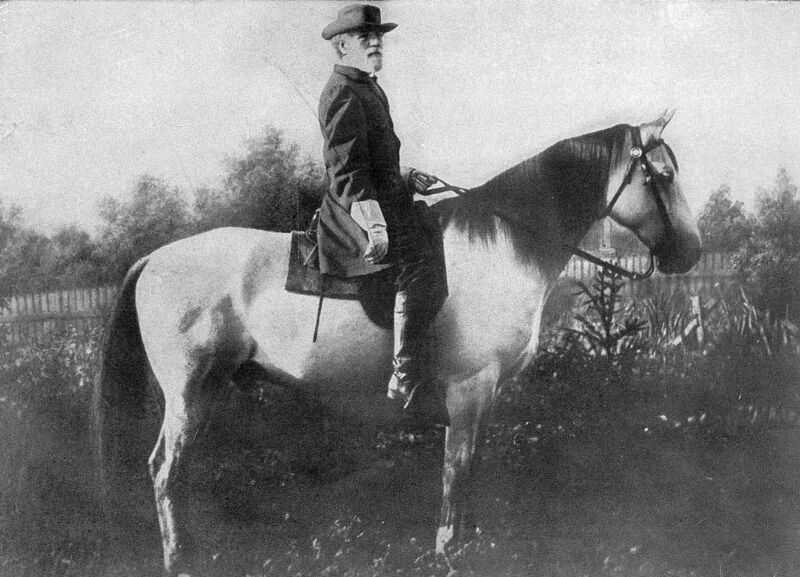 The general acquired the horse during his West Virginia Campaign in 1861. Traveller was Lee’s favorite horse throughout the war and was ridden in many famous battles and moments in the commander’s military leadership. It seems he was a good, steady horse. Lee described the steed as a “patient follower” and described his reliability through all campaigns. 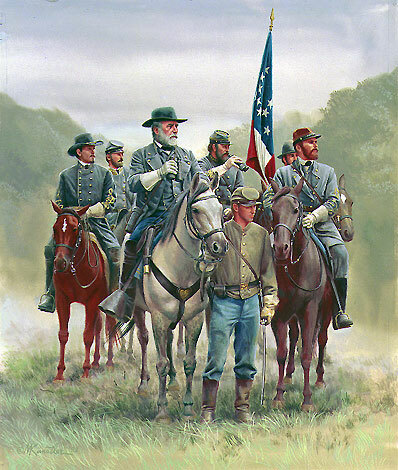 Traveller witnessed history making moments on many occasions including Lee’s victory moments at Chancellorsville, defeat at Gettysburg, determination at the Wilderness, and the surrender at Appomattox. Traveller was with General Lee during the Appomattox Campaign and surrender; he returned to Richmond with the defeated commander. From Richmond, Traveller eventually moved to greener pastures in Lexington, Virginia – near his master’s new position at Washington College. During the Lexington years, Traveller remained an “animal friend” for the general and his family. Lee would enjoy countryside rides on his favorite horse. Traveller’s coat changed from “Confederate gray” to white as he aged. Shortly after Lee’s death in 1870, Traveller stepped on a rusty nail. Unfortunately, it embedded in his foot and couldn’t be removed. Lee’s faithful horse died of lockjaw and was buried outside the Lee Memorial Chapel in Lexington, Virginia. Today, people walk by the horse’s marked grave as they go to pay their respects to the general; some stop to remember the stories of the horse. Traveller is “immortalized” in many statues. Most sculptures of Robert E. Lee depict him on a horse – and that horse is Traveller. P.S. Do you have a favorite equestrian story from the Civil War era? One of my favorite Traveller anecdotes concerns his tail. Apparently, when he was retired and his “dad” was President of Washington University, folks came by to pay their respects to both man and horse. It was considered OK to pull a hair or two from Traveller’s tail as a memento of the occasion. I am guessing no one asked the horse how he felt about having his tail thinned by visitors, but someone noticed that the once-full appendage was becoming noticeable threadbare. He was restabled in an area where he could be seen, but no one could get to his personal flyswatter any longer. Poor guy! In Douglas Southall Freeman’s biography, “R. E. Lee” (4 volumes), he related a story about Traveller on page 320 of Volume 3. At Spotsylvania, on May 11, 1864, I believe, Lee was riding Traveller and met General Gordon near the Mule Shoe. The result was one of the famous “Lee to the rear” episodes. Gordon’s troops attacked and Lee was looking for help for General Rodes. He found Harris’ brigade and ordered Harris to support Rodes. However, Federal batteries opened fire on them. Traveller became uncharacteristically skittish and started to rear wildly. Lee was able to stay on Traveller and tried to quiet him. Traveller reared up one more time and a round shot passed just under his stirrups, missing by a few inches. It was a close call. If Traveller was not in the air at the right time, Lee would have probably been killed. It’s been brought to our attention that A.L. Long may have incorrectly referenced the recipient of the letter describing Traveller. D.S. Freeman says the letter was sent to one of Mrs. Lee’s cousins. I decided to change it to “relative” until I have an opportunity to examine this more closely. Thank you to Larry De Maar for pointing this out in an email. We appreciate it and want to keep our articles accurate!